Content: 1 Pound (6 - 7 Pcs/lb). Aam is a hindi word for mango. Some sweets are truly classic and our Mango Sweet is one of them. Sandesh have their own charm, in terms of texture and taste and no other sweet come close to it. It is a favorite of any mithai lover to satisfy their sweet tooth. Special Fresh paneer (home made cheese) is made with whole milk, thoroughly washed with clean water, then a minimum amount of sugar and mango pulp is added for sweetness. Balls are hand rolled while the mix is still warm. If you never tried Sandesh, must order for your next party or treat yourself, we promise it will be a conversation sweet during your party. Major Ingredients: Whole Milk, Sugar, Mango Pulp & saffron. 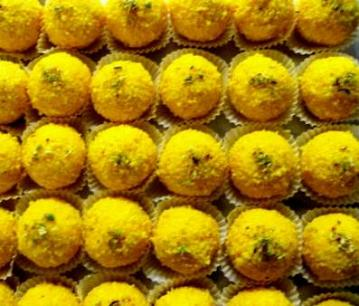 Buy Sandesh Aam, 1 Pound, sold & shipped by Bengali Sweet House where you can shop online for Quality Indian Sweets, Snacks & Gift Baskets Shop - Bengali Sweet House. This Indian Sweets collection has been tagged as mangos, indian sweets, gift box, indian mithai.